Other sports have matches. Not boxing. It has 'The Rumble in the Jungle', 'Judgement Day' and 'The War on October 4'. 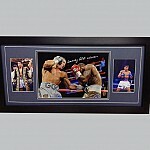 No sport does razzmatazz like boxing - which makes boxing memorabilia like no other form of collectible. There's something quite exceptional about the great boxing matches of our time. They live longer in the memory - and legend - than many other sports' great moments. 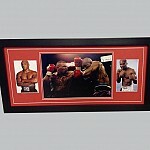 Even those who fell short of greatness live large in boxing memorabilia and memory. Who can forget Harry Carpenter's "He's got him with a right hand..! Keep going Frank!"? Bruno may have lost against Tyson, but as an event it captivated us all. 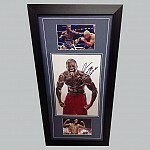 It's these moments, filled with legendary names, that make boxing collectibles so...well, collectible. 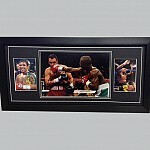 There's still such interest in signed boxing memorabilia from the likes of Ali, Holyfield and Tyson - and homegrown stars like Hatton, Calzaghe, Lewis and Haye that autographed boxing collectibles can prove a popular choice at charity auction events. Ask us for details. 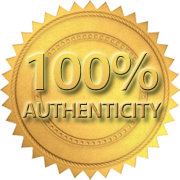 If it isn't authentic it doesn't count. 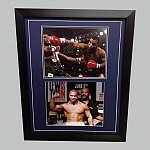 We're committed to authenticity and to ensuring all our boxing collectibles are genuine. 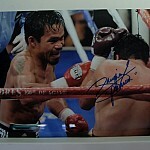 Our expert framing service will transform your autographed boxing memorabilia into a brilliant piece you'll be proud to display. And we're committed to keeping our prices low, so every fan has a chance to own a piece of legendary boxing memorabilia, without having to throw in the towel.